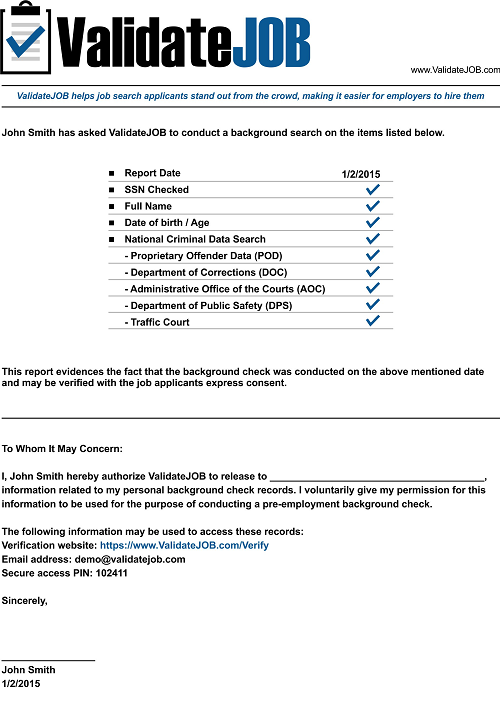 ValidateJOB Report is a background check done by a job applicant with the intent of showing an employer, that the job applicant is a good candidate and is willing to take the extra step to establish their credentials. This simple step differentiates the applicant from other job seekers as it provides additional information to the employer. On an average, almost 120 candidates apply for a job, making the interview process extremely difficult. Differentiating yourself from other candidates makes you more visible and consequently improves your chances of getting the job. As ValidateJOB is an employee initiated check, the employer would be better informed about the person being interviewed and have their background information in advance. This could relieve the employer of concerns related to the job applicant not meeting their requirements. Job applicants who attach a ValidateJOB Report to their application may stand out from others, as this demonstrates a level of confidence and makes the employer look at the applicant in a positive manner. On receiving the report, make sure that all information that is shown is accurate and relates to you. You can use ValidateJOB’s secure PIN based services to share the report with only those employers who you wish to provide information to - You control access to the information and decide who can view it.